Home / Blogs/Why Choose Dedicated Web Hosting? Dedicated hosting refers to a configuration in which a host devotes a server to a single organization or for one purpose such as a website. It is the opposite of shared hosting whereby a server hosts multiple clients. 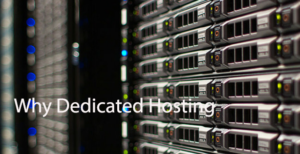 Dedicated hosting is also called a dedicated server. It can be set-up in-house or externally as a service within a data center. Dedicated hosting comes with the advantages. Dedicated hosting will grant you a certain control and freedom that are not available with other hosting options. The fact that a server is dedicated to you and does not have any cohabitants means that it and the overall hosting solution can be customized to serve your specific needs. You can customize your disk space, software, CPU, and Ram unlike shared hosting where the operating environment is in place. You will select and pay for the features you require. Using a dedicated platform provides more options for deploying security measures such as custom firewall and anti-virus configurations for certain functions. It allows increased security which is especially essential for companies that handle sensitive transactions over SSL or FTP. At the same time, you avoid the security risks that activities by neighboring clients on your shared hosting platforms can cause. You could share space with a potential spammer or a malicious site. A dedicated server located within data centers benefits from physical security measures put in place in the place such as security guards, biometric authentication, and CCTV surveillance. Convenient service is a magnet for loyal customers. A website is essential for online business and it t is vital for to ensure that all the time it is functional. Downtime could make you lose customers to competition and miss out on new ones. Dedicated hosting allows stability and high performance that makes sites and other functions to be operational more than 99%. Dedicate hosting is the best option if your website receives a lot of traffic. A hosting provider should ensure maximum uptime by offering server monitoring, back-up, and support services to maintain the seamless running of functions as possible. Every server has a distinctive IP address. When sharing a host, you also share the same IP address with many other websites. If one of them is a spam site or has controversial content, it could contribute to pushing down the website rank. Dedicated hosting allows you to use a dedicated server with unique IP address. It is essential if you run an e-commerce site requiring SSL for processing credit cards. Server congestion will not be a problem when you use a dedicated server. It is free from the troubles associated with shared hosting that run the risk of congestion caused by usage level for an application or other websites hosted on the same server. They will all be competing for CPU disk space and bandwidth. If your site is resource heavy, dedicated hosting allows it to function without disrupting others. Most dedicated hosting services have a certain level of support. The reason is that they serve dedicated customers who use their service to host important websites, computing or mission critical functions. Active support guarantees that site disruption is minimal and if it happens, the solution will be fast. Hosting providers offer details of support levels and reliability statistics on their service level agreement. These documents usually provide an insight into the kind of service you can expect hence it is essential to scrutinize them well before choosing a provider. 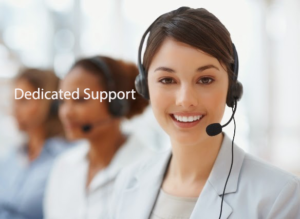 If you are getting no support, you should get all the necessary information on server management and maintenance. Dedicated hosting might cost more than other options, but it provides optimal performance, custom operating and security.